Crispy asparagus tempura served with a light dipping sauce. In a large, deep skillet, heat 3 inches of oil to 330° F. When the oil reaches the correct temperature, turn the heat to low and keep the oil hot. Remove the hard stem of the asparagus and the scales. Cut each asparagus in half. 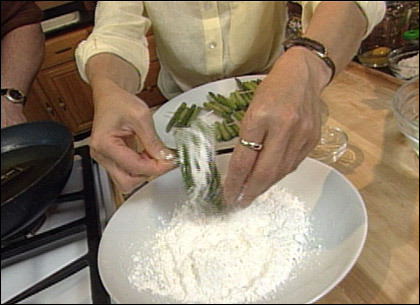 Place the asparagus onto toothpicks, four per toothpick, then dredge in cake flour. In a 2-cup measuring cup, beat the egg lightly, and add enough ice-cold water to make 3/4 cup of liquid. Transfer the egg liquid to a medium bowl, and lightly beat with a whisk. Sift the 3/4 cup of flour, cornstarch and baking powder into a bowl. Add the sifted flour mixture to the egg liquid and stir briefly with the whisk. Turn the heat for the oil to medium and heat the oil to 350° F. Pick up one toothpick, and dip it into the batter. Remove the asparagus from the batter, and lightly shake off the excess. Carefully add the asparagus to the heated oil. Cook all the asparagus in the same way, in small batches, three to five toothpicks of asparagus at one time (depending on the size of the skillet), until the outsides are crisp, about 1 minute. While cooking the asparagus, adjust the heat to maintain the temperature at 340° F. Careful control of the oil temperature is the key to successful tempura preparation. Serve the tempura immediately so it remains crisp on the outside and juicy on the inside. Serve the dipping sauce (see recipe below) and grated daikon in separate small bowls on the side for each diner. 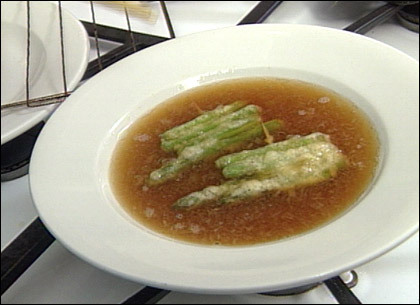 Diners can add a little grated daikon to the sauce before dipping the asparagus into it. In a medium pot, bring all the ingredients to a boil. Remove the pot from the heat, and let the sauce cool to room temperature. You can refrigerate the sauce for up to three days, covered. Before using, heat it through and let it cool to room temperature.